Double-sided adhesive tape with a bioriented polypropylene backing and a paper liner siliconed on both sides. This tape has excellent adhesion and good resistance to temperature and ageing. Ideal for industrial uses, "do-it-yourself" and household applications, it is available in various sizes. Double-sided adhesive tape with unwoven fabric backing coated with high adhesive weight in Hot Melt to ensure excellent fixing even on rough surfaces such as FELTS, FABRICS, SPONGY and PLASTIC MATERIALS. Particularly suited for carpets laying. Double-sided adhesive tape with cotton-polyester cloth backing. Thanks to its high adhesive mass, it fits perfectly to rough surfaces. Particular siuted to carpets laying and floors covering, coupling with felts, cloth, fabrics and sponges. Notable initial adhesion and excellent resitance to ageing are characteristic of this tape. 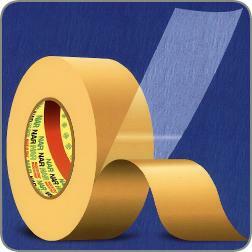 Double-sided adhesive tape specially designed for carpets laying on flooring surfaces, leaving no traces when removed. Each side of the Polypropylene backing is coated with a different type of adhesive. Ideal for carpets laying in exhibition booths. Double-sided adhesive tape with special strechable Polypropylene backing which makes the application to uneven surfaces easier. Thanks to this characteristic, it is suitably used in many industrial applications. This tape has also a very tenacious adhesion and a strong resistance to load to which it is applied.